UPDATE 6-25-2012: A fire started in the area of this trail on Saturday afternoon 6/23. From what I understand now, much, if not all, of this beautiful trail has burned. Very sad.. I'm so glad I had the opportunity to run this 4 or 5 times before this weekend... anyway, these pics serve as more of a memorial now... hope you enjoy them. Also, if/when the trail reopens, you know I'll be out there and update with new pics. 5/31/12-So yesterday I finally decided to run Waldo Canyon Trail, instead of my usual Manitou Incline/Barr Trail. I don't know why I haven't done this one, as I've heard great things about it. Perhaps I was a little intimidated by the climbing, and the 7 mile length. So glad I finally did! I've driven past the trail head for this one many times, and it gets quite popular in the afternoons on the weekends, and now I know why. Right away after a few switch backs the trail carries you out to a point that sticks out over the highway in the pass. I look up at this point all the time, so it was so cool to finally be up top. Amazing the mixture of quartz, granite and sandstone... really cool. To get to the loop portion of the trail it is about 1.7 mi of rolling trail that runs along some ridges and down through the trees.... some really pretty (and tight) single-track. Loved seeing all the yucca's and other flowers in bloom. At the beginning of the ~ 3.5 mi "loop" portion, there is a very cool bench (Eagle scout project), and a well marked sign noting the loop. I went clockwise around to hit some of the steeper stuff going up, versus down. From this point the trail continues to climb to reach the high point about halfway through the loop. Overall the trail gains just over 1,000 ft.. starting at just over 7,000 ft and reaching close to 8,100 ft at the top. What I really liked about this portion is when the trail really opened up to great views of Pikes Peak.. Finally, the downhill portion of the trail begins..... my favorite part of course.. Here's the best part... I was cruising along and thinking "wow.... I love this trail... it is so awesome... it's beautiful... I'm just gliding on down the trail.... it doesn't get any better than this...." and of course, those of you that run trails knows exactly what happened next! Yep... see this pic below? I took it after the header I took.... yep, see that root in the trail... just exploded out of the ground and grabbed my foot... I know it wasn't there before hand! So.. after it grabbed me, I tried to recover, but it never happened. At least I'm learning a lot about trail running, and I am getting better at precisely knowing how much time I dedicate to recovering from a trip, and when to give it up and switch to damage control. Realizing I couldn't save it, I tucked my shoulder down and ended up rolling into a thicket of small trees/bushes off to the right... I feel bad because I snapped one off pretty good... anyway, next thing I knew, I was laid out... looking up through the cool green leaves.. took the required 30-45 sec systems check of my body (old guys like me understand this), and once I realized I was just scraped up and nothing more... got up to brush myself off. Ended up with some good scrapes on my face, arms, knee etc.... but nothing long lasting... oh, and I did manage to lose another pair of $2 sunglasses.... if anyone is out on the trail, look around this broken bush below... you might score a pair! Anyway.... I will absolutely be back on this 7 miler soon and often. I plan to run the inside loop twice to get my mileage up over 10 miles... should be a great time. Oh.. and don't forget about the Nuun and Clif Shot Bloks giveaway! Click here to enter before Saturday! Ok... it's your lucky week... 2 reviews for the price of 1, and a give away! Over the past few weeks I've been trying out two great products from Nuun Hydration, and Clif Bar. I decided to review these together, as they seem to go hand-in-hand.. at least for me that is. Plus, I have a few extra's to giveaway, so see the instructions below to enter! First of all, are the Nuun Active Hydration tablets. The folks at Nuun have a great family of hydration products, and I tried out these electrolyte loaded tablets in my hand-held water bottle. Each tube from Nuun contains 12 tablets, and 1 tablet can be dissolved in 16 oz of water in about 2 minutes. So, for the past few longer runs, I've been dropping a tab into my water bottle. What I really like about Nuun is that it is not loaded with sugars. I've tried running while drinking Gatorade, or sipping some during a race, but I can't get over the sugary sweetness. I tried diluting it, and that helped somewhat. Nuun doesn't have that sticky sweetness, but just enough flavor to make if pleasant to drink, and provide an electrolyte replacement. What's funny is that when I first tried it, it had an oddly familiar flavor and taste, but I couldn't put my finger on it. Finally it hit me... Fizzies! Ok... this may be familiar to those of you that were kids in the 70's like myself. Goofy Alka-Seltzer type tablets that were flavored and you could drop into water. Not overly sweet and fun to drink... well, actually I think we licked them straight out of the package... haven't tried that with Nuun yet! Anyway, I think these are a great alternative to sweetened energy drinks, and the convenience is great... you could sneak a few tablets along with you during a race, and just plunk one in when you refill your water bottle etc. In addition to the lemon-lime, I also tried the Lemon-Tea version, which provides 20mg of caffeine as well... bonus! (Plus it looks just like beer!) I have a bottle of each to give away below, or enough to make 3 gallons! Also, check out their website for 9 other cool flavors. 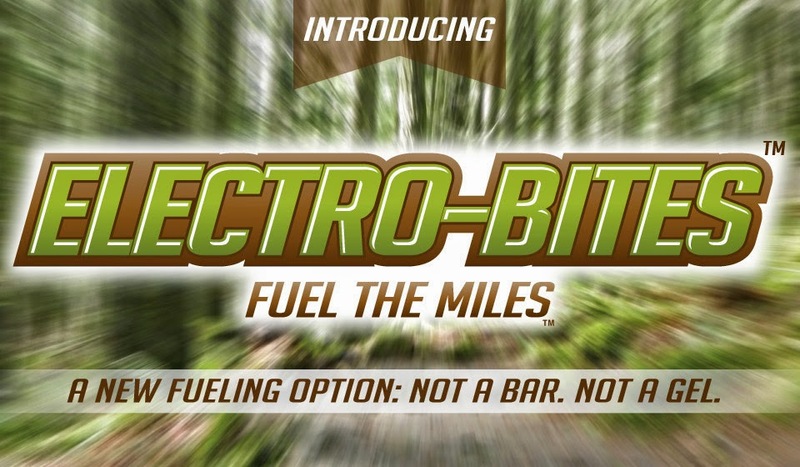 Now as far as fueling options go, there are a variety of gels, bars, and other ways to get quick energy on the run. Up to this point, I've tried some GU Gels, which were ok.. a little thick, and also making my own energy bites (see my recipe tab above for those). As I was doing some research, I came across Clif Shot Bloks. What drew me to Clif was the fact that they use simple, organic ingredients, which is important to me. And, as you can see above, they have a variety of flavors, some with various levels of caffeine, and one with extra sodium. Each packet contains 6 "Bloks", that are about 33 calories each. So one packet is roughly equivalent to 2 gel packs. The nice thing about these is that with it separated into smaller, easily dispensed blocks, you can control how much you have at a time. It's easy to open the package to dispense the blocks, and they aren't messy like a gel, and the packages are easy to fold over to close up. Simply give a little squeeze, and you can easily pinch one off.... uh... wait, that doesn't sound very appealing... lets just say they are easy to dispense. Pop one in your mouth, and press the others back down a bit, and you can put the pack back into your pocket, or whatever you are using to carry stuff, and its ready to go... no sticky mess, and it's easy to measure how much you are taking in over time. My only warning on these is that the Bloks are a little chunky, and have the texture of a softer gummy bear. That being said, don't try to down one of these if you are hyperventilating (like I often am), as it wouldn't be pretty to aspirate a chunk... but that part aside, these are great tasting, 95% organic, and provide a good boost when you need it. 6-2-12 WINNER Update: Congrats Laura on your comment being randomly selected as the winner!! 1. Leave a comment below and tell me about your how you hydrate and fuel for longer runs. 6. "Like" Clif Bar and Nuun on Facebook and leave me a comment letting me know. After the contest closes on Saturday June 2nd, at 8pm MST, I will be using Random.org to generate sequence numbers for all comments received, and determine a winner. I will contact winners via the email addresses provided when commenting (but not shown or shared). Ok... I apologize for the title of this post, but I can't help it if I'm a nerd... when I hear Bedrock, I think Flintstones of course! Maybe its not so much nerdiness as age... ah well, getting distracted already. I'm very excited to finally put together a review for the Bedrock Earthquake huarache sandal. Bedrock is a very cool company, started by two friends Dan and Nick, and was officially launched last June via Kickstarter. They both share a passion for trail running and geology, and they started designing and building their own huarache for trail hiking and running. As far as huarache style running sandals go, my only other experience has been with Invisible Shoes. I've owned a pair of the 6mm Contacts since last fall. While this is not exactly a direct comparison between the two, I will mention a few things that may be helpful to those of you familiar with Invisible Shoes. The Earthquakes are made with a 6mm Vibram "Gumlite" sole, which according to Bedrock is a mesh between neoprene and rubber. The result is a very light-weight sole with great ground feel. The Earthquakes are probably half the weight of my Invisible Shoes (judging by holding the pair of Earthquakes in one hand, and one Invisible Shoe in the other. The tread pattern is a series of little dots, that almost look like sucker-cups. 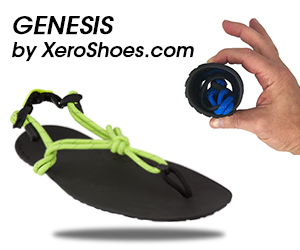 Since the sole is so flexible, these little dots provided me great traction in loose dirt and gravel. I haven't had much opportunity to run in real wet mucky stuff yet, but my impression is that these will grip well for a sandal. And of course, the required "flex" test for minimalist shoes. As you can see, the Earthquakes are super flexible for a 6mm sole. These would be easy to pack! 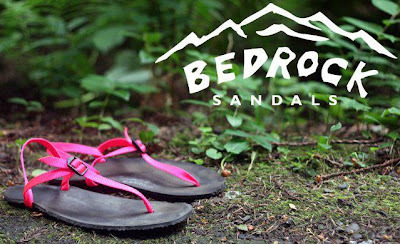 Finally, the Bedrocks utilize military grade nylon strapping to attached to your foot and ankle. The straps follow the standard huarache pattern, looping through slots next to the ankles and then through a hole between the toes. The nylon strap is then ignited to melt, then flattened to hold the front of the strap in place. There is a little bit of a lump there, but after running it bit, it flattened out more and isn't noticeable between the toes. 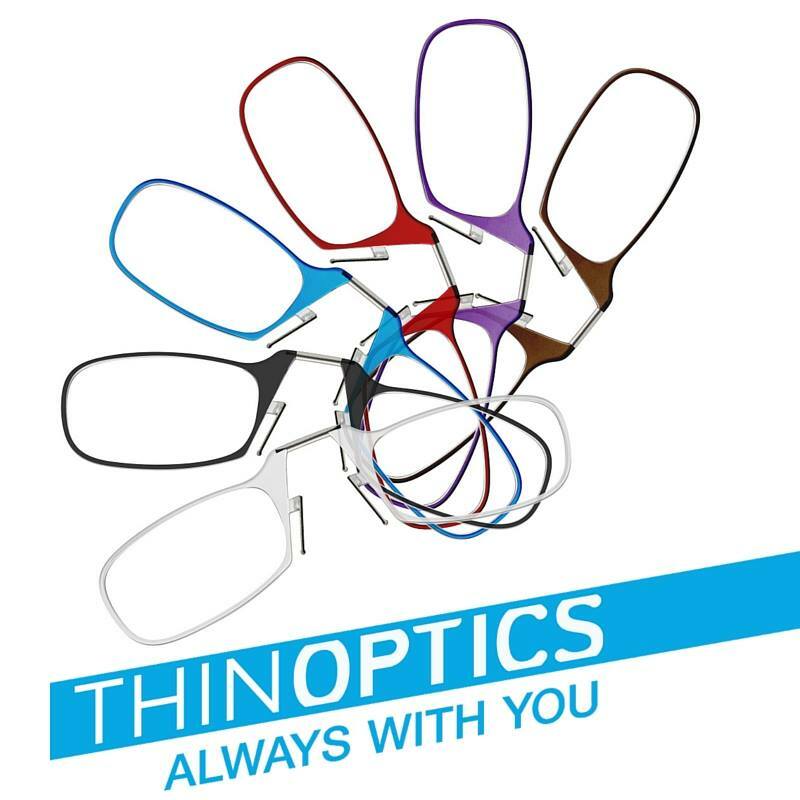 As opposed to thinner cord-type material, the nylon strapping is very soft, and comfortable against the skin. The single buckle on top slides up and down on the main strap so you can adjust the position, and with a simple twist, you can then use the buckle to adjust the tension of the strap to what is most comfortable. I fiddled with the adjustments a bit, finding the right tension for my heel and my foot. Once I liked where it was, the settings didn't move. That is a huge bonus with these sandals. 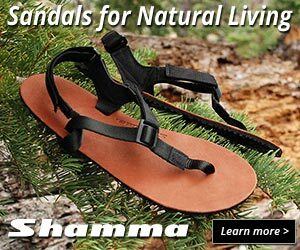 While you may take a while dialing in the exact fit for your taste, once you find it, the sandals stay that way. Besides this super easy and effective strapping method, the Earthquake also features a unique rubber heel strap. As you can see, this is an elastic strap (made from used bike inner tubes) allows a little flex in the heel strap which makes it very comfortable, snug, and it stays put while running. I really like this feature. I have to say that after about 35+ miles of trails (and a few road miles), these sandals are really comfortable. What is awesome about them is that they are so light, and the strapping works so well, that the sandals stay stuck to the bottom of your feet, and the straps remain comfortable. After a longer run, and wearing them all day, I had no red marks or sore areas on my feet. This great fit also helps a lot on downhill trail runs.. again, no issues for me in the Earthquakes. So... if you are looking for a comfortable, well-built, pair of minimalist huaraches, and especially if you like trail running, the Bedrock Earthquakes are a excellent choice. I don't have a lot of negatives to offer around these sandals. As with most shoes, my larger concern would be how they hold up over the long haul, so I will make sure I provide a follow up once I put a significant amount of wear on them. If you have any questions about the Earthquakes, or if I've missed something, please let me know. Or just email Dan at Bedrock and I know he'll take care of you quickly! Also, I forgot to mention that Bedrock sponsored their first full and 1/2 marathon trail race this year in Virginia. 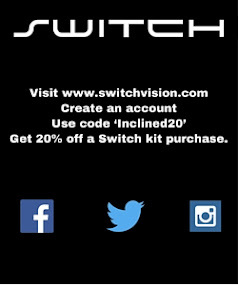 Check it out here. I saw some pics from it, and the trails just looked gorgeous! Finally, I love the little Bedrock sticker that came with them.... it fit perfectly above my Eatmorekale.com sticker on my water bottle! Ok all.. thanks for slogging through another review... I hope it was helpful! Have a safe and happy Memorial Day weekend! 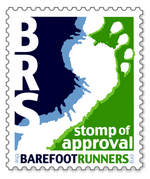 I'll check back in after the Bolder Boulder 10K this Monday! As part of my continuous pursuit for great minimalist running shoes, I've looked at a number of different companies and shoes in the market. I remember seeing a few blurbs about kigo footwear and I was intrigued by their design, and the company itself. I am very fortunate to have been provided an opportunity to test and review the kigo "drive" pictured above. Before I dive into the nitty gritty review however, I did want to talk a little bit about the company. First of all, it was no mistake above that I didn't capitalize kigo, or drive. As a matter of fact, virtually everything on kigo's site is that way. One of the co-founders has a Masters in Literature, and she loves poetry and the creative use of language, hence the e. e. cummings style :-) I think it also reflects on the minimalist style of their shoes, and their company philosophy. And, it saves me the time of hitting the shift key! 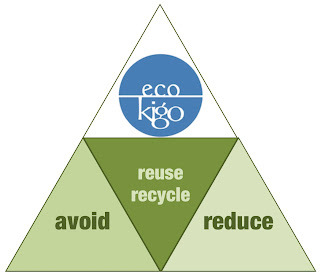 I also am impressed about kigo's focus on sustainability. 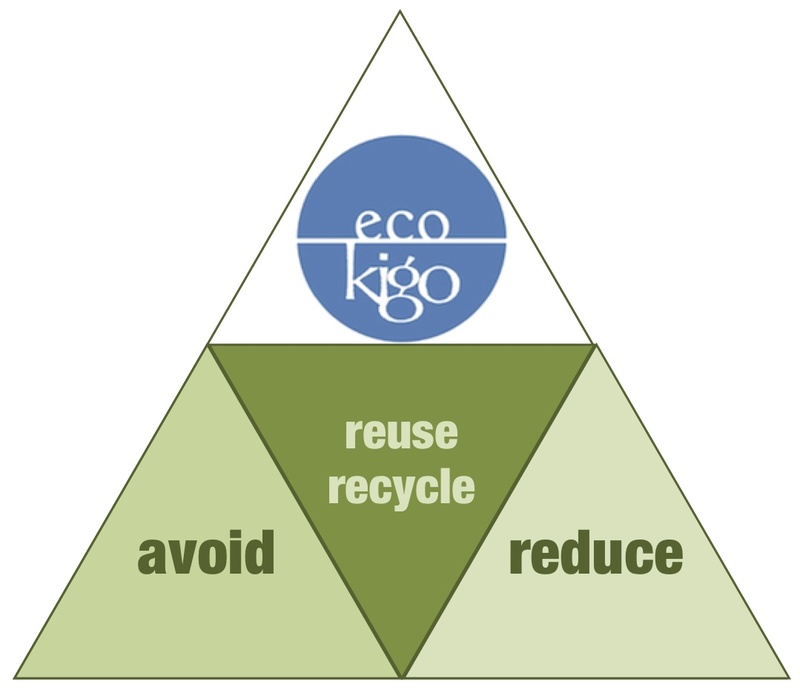 From the philosophy about work, packaging, and reuse/recycling to the materials used in the construction of the shoes, kigo is truly benchmark. 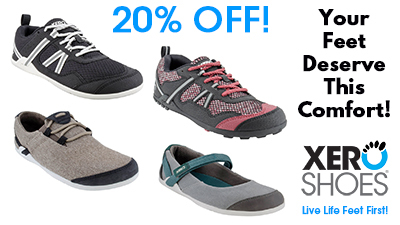 kigos are recyclable too, and the company will give you 25% off a new pair when you return your old ones! I'll cover more about the materials in the review below, but if you want to read all about it, check it out here. Next to my Vibram Flow's, these are by far the most minimalist shoes I've run in, from a ground height perspective. I kept the insoles in, because I found that it provided the best fit for me inside the shoe. Without the insole, I felt it was a little too roomy and I couldn't snug up the laces enough. However, the proprioception with the insoles is still outstanding. And talk about light weight! I loved how it felt like I had nearly nothing on my feet. As far as the soles go, I like the imprint.. it leaves cool footprints! However, it is not a super aggressive tread, so I would be careful in instances where traction could be a problem, but this tread pattern worked great on the road, and surprisingly well on the trail for me as well. I think the flexibility and ground feel from the shoe allows for good gripping when needed. Also, you'll notice that the shoe is almost straight... it was funny because the first time I put them on, I wasn't sure I had them on the right feet! It made me aware of how even many minimalist shoes have some kind of structure or form to them. These didn't put any odd pressures anywhere on my feet. And the toe box was plenty roomy for me as well. I think my feet are "average", so for these shoes, my concern would be if you had a narrow foot.. you may not be able to tighten things up as much as you may like and they could feel sloppy. So... how do they perform? I will admit that when I first saw these shoes, and even after I tried them on, I was skeptical about how well I would like them for running, especially trail running. They just seemed too insubstantial, and I was concerned about durability as well as comfort. For my first run on the road, they felt great. What struck me most was the fact that I had nothing to think about or contemplate about the feedback from the shoes. They were very comfortable, so comfortable that I forgot about thinking about them, and focused on running instead. The light weight made me feel I could run faster, so that's what I did. I was out for a 5K, but that decided to just push that first mile... I ran my first sub 8 minute mile, which for me is fast considering my running pace is in the 10:30-11:30 range. And over the 5k, no hotspots or stopping for adjustments etc. Also, as you can see above, I paired the kigos with Injinji Outdoor Series, light-weight toe socks (no show length). This turned out to be a really great combination with this shoe. Are the kigo drives trail-worthy? I would say yes! Granted, I'm not an ultra distance runner (not yet at least), so my long trail runs are in the 6+ mile range. I took the drives out to my favorite trails to see what they could do. The first thing I noticed was that even with a 4mm ground height, and no rock plate, I wasn't getting that sting from some of the nastier rocks that I've felt in shoes with 6 or 8mm of height. I don't know if it was because I was mentally making myself run lighter (which is not a bad thing), or that I was getting better at dancing around some of the tougher stuff. It was probably a combination of both, but there must be something about the composition of the sole that help disperse some of the terrain without sacrificing the ground feel. Regardless, I was pleasantly surprised that such a thin and light shoe performed as it did. Granted, they still may not be substantial or protective enough for really long technical runs, but I'll let you know when I get there! Also, you can see me daintily putting my foot down for a stream crossing, but on the way back, I jumped in with both feet to see how they dealt with water. WOW... at least right now, these uppers are the true definition of hydrophobic. Water beads immediately and drops off... This is because the uppers are constructed of CYCLEPET, which is a flexible fabric made from plastic jugs, which is then treated with an eco-friendly water/stain repellent called AsahiGuard E-Series. What remains to be seen is how long this treatment will last over time. Also, the fabric of the upper stretches and molds to your foot, as I've noticed over a few runs. kigo's website notes that you can reset, or tighten the fabric by washing (no soap), and sun-drying them. Of course, none of my reviews are complete unless I've gone up the Manitou Incline a few times, and down Barr Trail. I haven't been up the Incline as often as I was going over the winter, but this morning I was about 30 sec shy of my personal best going up.. I credit the light shoes! Then of course, I had to put my feet up in front of Pikes Peak.. hard to believe I am planning on running up and down that next summer! Oops... forgot about the price. You can get the drive for $91 retail on the kigo site, or from one of their retailers here.https://www.kigofootwear.com/retail.asp. While not exactly inexpensive, these are priced in the "normal" range for minimalist shoes, and not bad considering the eco friendly materials and processes. BUT as a special bonus for readers, you can use the code BFIREVIEW at checkout for 20% of your purchase through 5/24/2012. So.. there you have it. I know.. long-winded, but if you've hung on this long, congratulations. If I've missed anything in my review, or if you have questions, please let me know. I'll probably put up another longer term review later this year after logging more miles in these great shoes. For a cool story about the long-term durability of their shoes, check out their 12 month long world trek on this blog Vamos Kigo!